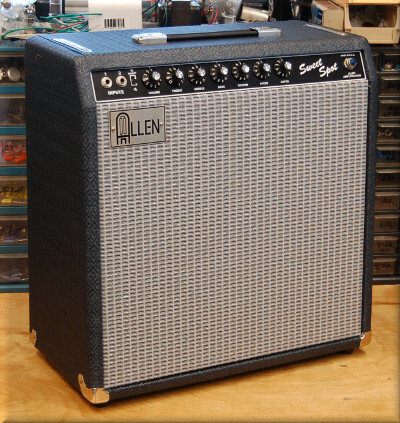 18 watts (6V6 power tubes) or 25 watts (6L6 power tubes with plug-in solid-state rectifier). (4) 12AX7s, (2) 6V6 or 6L6 and (1) GZ34. Treble, Bass and Mid/Raw controls. All-tube driven 3-spring medium-delay Accutronics tank in a heavy vinyl bag with shielded cables. Thick 14 ga aluminum for low weight, low noise, no corrosion. Hand-wired point-to-point with tinned solid-core PVC wiring, G-10 glass epoxy circuit board with brass eyelets. Carbon film resistors, Mallory M150 and CDM silver mica tone capacitors, Switchcraft jacks, Carling switches, Belton micalex 9-pin sockets, and ceramic octal sockets. 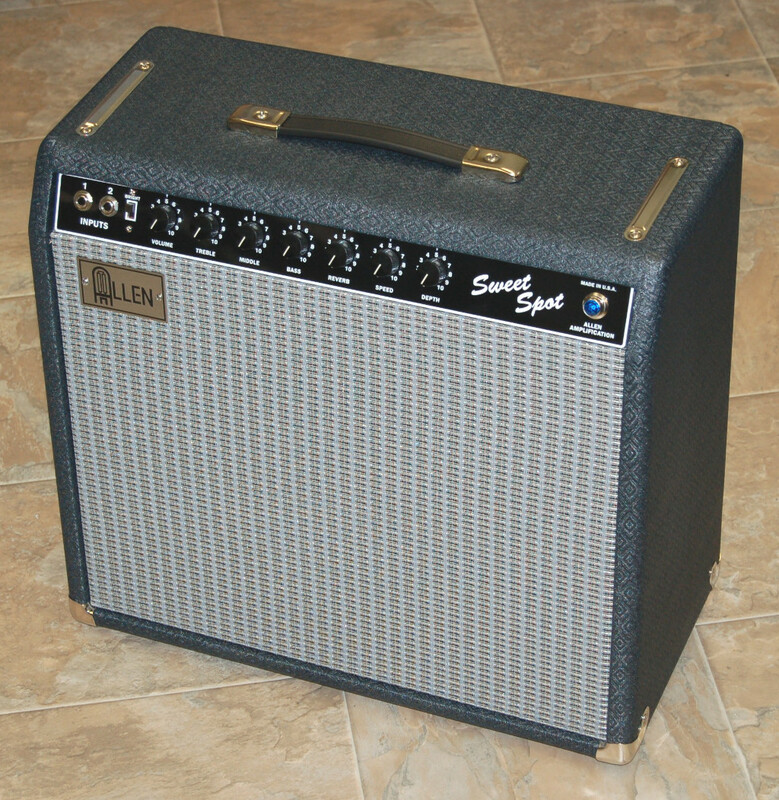 Design is loosely based on the Fender Princeton Reverb but with many enhancements such as a standby switch, MID/RAW control, bright switch, fixed bias phase inverter, deeper vibrato, adjustable power tube bias and bias measurement jacks. Finger-jointed pine with black Tolex covering and black/white/silver sparkle grill cloth. 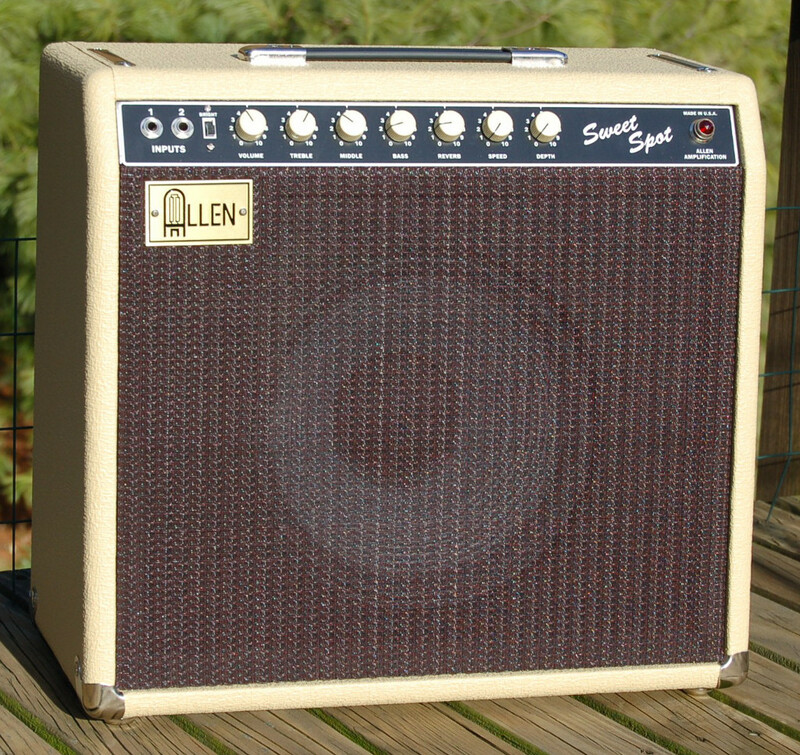 Tolex covered rear screw-on panels, rubber feet, black rubber (steel reinforced) carrying handle with chrome caps and screws and bottom chrome corners. Eminence Copperhead 10" in the 1x10 combo. Eminence Red, White and Blues 12" in the 1x12. Bright switch, RAW mid/gain boost control, rear panel bias measurement jacks, bias adjustment pot, fixed bias phase inverter and a lightweight aluminum chassis. 1x10 Combo - 20"W x 16"H x 9-1/4"D, 31 lbs. 1x12 Combo - 20"W x 20"H x 9-1/4"D, 35 lbs. Head - 20"W x 9"H x 9-1/4"D, 22 lbs. Sweet Spot clips below provided by The Sound LLC in Charlottesville, VA. Clips played by Jason Butler on a 50's reissue Tele, or K.W. Miller on a 50's reissue Tele or Les Paul with P90s. This is a recording of guitarist Bradford Meyers playing a Guild archtop with humbucking pickups through an Allen Sweet Spot 1-12. The microphone was a Shure beta 56 through a Sytek preamp into Protools HD. No compression, no eq, the reverb is from the amp itself. Recording engineers Phil Combs and Marcos Sastre. 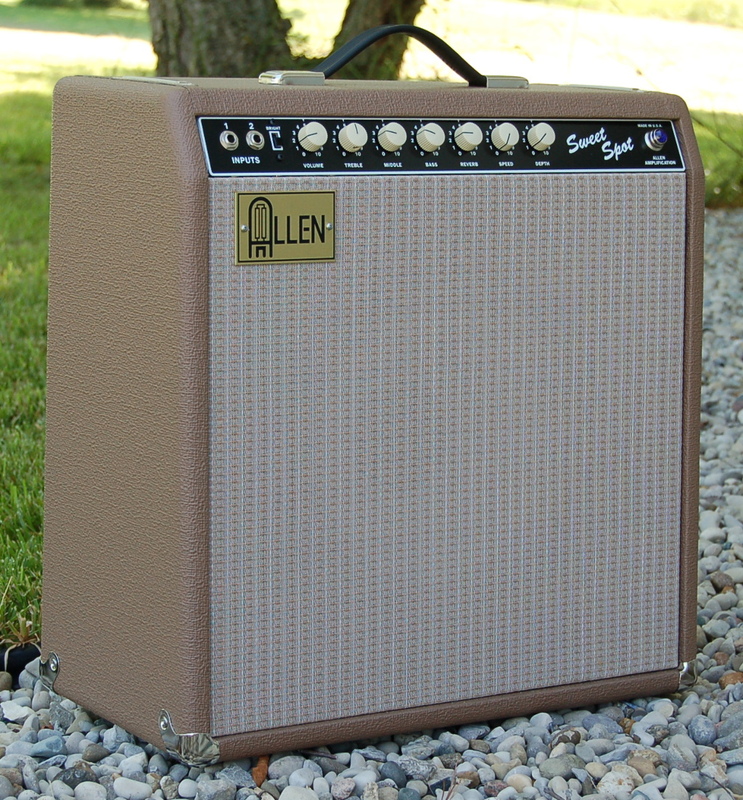 Tony Sims checks out the Allen Sweet Spot amp. 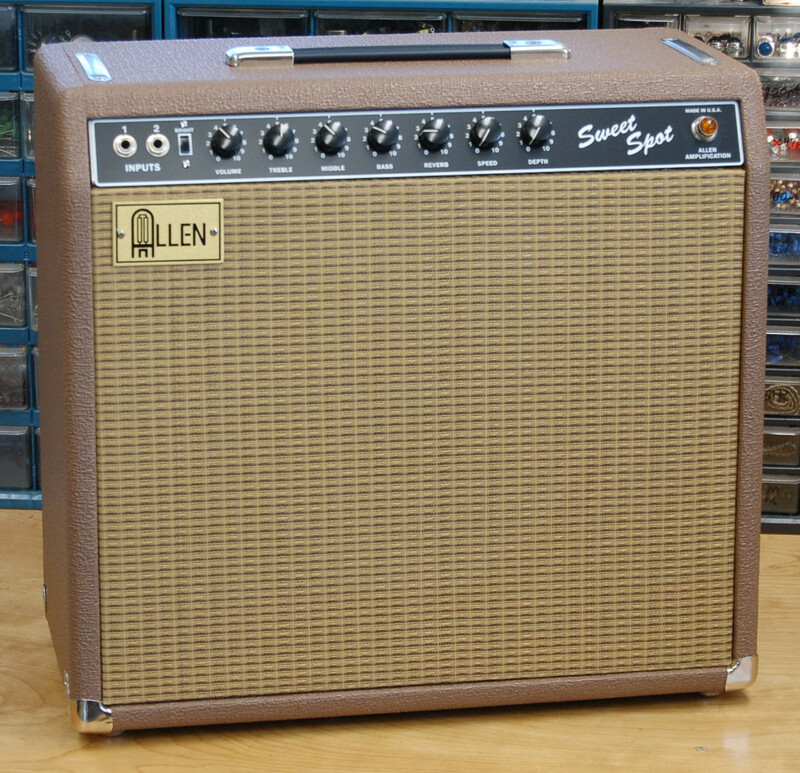 Sarasota Slim happened to be playing his Allen Sweet Spot 1x12 for this very cool video. He also used it extensively on his soon to be released CD. It was set up with 6V6s and and old Fender orange JBL. Thanks for sharing this with us, Gene!